This article in .pdf-format in French . 1) This paper has been prepared and presented at the FIG Working Week / GSDI-8 Conference in Cairo, Egypt, April 16-21, 2005. It is also a contribution to the discussion how professional associations can contribute to risk and disaster management. At its meeting in Cairo the Joint Board of Geospatial Information Societies decided to establish an ad hoc working party on risk and disaster management, chaired by Prof. Bengt Rystedt from ICA. Like most of us, I was horrified by the death toll left by the tsunami, saddened by the thought of all the orphans and broken up families and amazed by the magnitude of the disaster. Then, I asked to myself, what can I do? I wondered what I could personally do to help; how my knowledge and experience could benefit the victims at a tangible level? In a near future, it will be necessary to start the resettlement of these devastated communities. The scope of the task ahead is staggering? In certain areas, everything was completely destroyed, wiped out by the devastating wave. They have to rebuild everything … from scratch. It is worst than after a war. How can you resettle communities and land owners without any fences, buildings or occupation marks? What a challenge … even for a land surveyor! Many of us have been involved, in our respective countries, in a project of reconstruction or resettlement after a natural disaster. Flood, landslide, hurricane, avalanche, and, or rare occasions, tsunami, are some of the situations in which land surveyors have to get involved. Our contribution is neither spectacular nor glamorous. We are not under the spotlight like rescue teams, policemen, doctors, etc. Nevertheless, our role is no less important but merely, too often, unknown or misunderstood. As land experts and guardians of land rights, we are what could be called « peace keepers by anticipation». In fact, our intervention regarding land rights and land tenure issues may avoid further land conflicts. We must remember that every war between nations or conflict between two neighbours finds its source in the right to a piece of land. This is why the land surveyor’s role is so important in a project of resettlement after a natural disaster. And it is that much more critical after the Asian Tsunami because the level of devastation is colossal. In a best case scenario, some spatial data infrastructure and a geo-based cadastre may exist. Hopefully it is the case in some areas like Phuket. But elsewhere? It will almost be like starting over. And that is why it will be crucial to resettle people correctly, to respect everyone’s land rights, both legal and customary rights. We, as land surveyors, are aware of the role that we can play after a natural disaster like the one that affected countries surrounding the Indian Ocean last December. But how can we be sure that our role will be taken into consideration within the reconstruction plans if we are not there on the ground? As far as we know, a non-governmental organization (NGO) formed to intervene after a natural disaster to manage the land tenure issues, a kind of Land Surveyor Without Frontiers does not exist. So, who takes care of land tenure issues? How are they managed? Guidelines for Operational Programme formulation in post disaster situations 6). Surprisingly, in these documents, there is not a single word about land tenure issues. 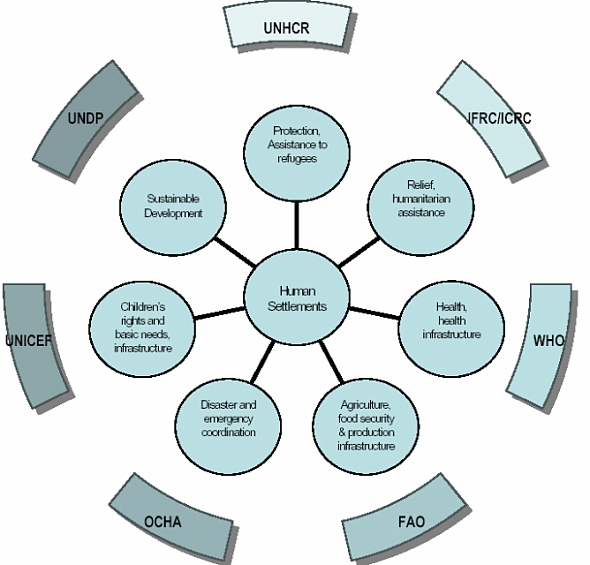 Fortunately, UN-HABITAT launched, in July 2003, the Disaster Management Programme (DMP) 7) . The mission of this programme is to support national governments, local authorities and civil society into strengthening their capacity to manage human-made and natural disasters affecting human settlements. The DMP operates under the Disaster, Post-Conflict and Safety Section, Urban Development Branch of UN-HABITAT. It was created to marshal the resources of UN-HABITAT and other agencies to provide local government, civil society and private sector with practical strategies for mitigating and recovering from conflicts and natural disasters in the context of human settlements. 7) United Nations Human Settlements Programme. Disaster Management Programme – Concept Document. 2003. Strengthening legal frameworks in regard to land and property. Further in the document we can read that DMP also provides support in land and property management, and facilitates deployment of a team of legal and land management experts to undertake scoping and immediate measures protecting the land and property rights of displaced persons, and developing longer term solutions for land and property dispute resolution. After the Asian tsunami, or more generally after any natural disaster, many UN agencies are mobilized to help affected countries. DMP/UN-HABITAT has a central position in the UN system in terms of sustainable human settlement and seems to play a key role in post disaster situation. 4. HOW CAN WE PARTICIPATE IN THE RECONSTRUCTION? In general, UN agencies are not very loquacious about land tenure issues and the different aspects regarding land rights that could be taken into account after a natural disaster. To our knowledge, since December 26th, in all the news, press releases and documents issued by the United Nations and its agencies, none were about land tenure issues. The international land surveyors’ community has to promote the importance of land tenure aspects after a natural disaster, specifically in conjunction with UN agencies. We have to be involved early in the reconstruction project to ensure that land tenure and boundary aspects are thought out in the reconstruction/resettlement plan. One month after the Indian Ocean Tsunami, Mr Jan Egeland, the United Nations Under-Secretary-General for Humanitarian Affairs and Emergency Relief Coordinator said, «I think we are starting now the new phase, as of today, which is the recovery and rehabilitation phase» 8). 8) United Nations. One month into tsunami relief effort, UN faces even bigger rehabilitation task. UN Press Release 26 January 2005. «We did save a lot of lives, but we have not rebuilt their livelihoods nor given them a standard of living that is anywhere near what they should have», he declared. «That is a big, big task ahead and that will be even bigger than the lifesaving emergency phase». The international land surveyors’ community has to be part of this reconstruction phase. Develop an intervention collaboration strategy between FIG and UN agencies. Creating a new NGO may not be a good option as there are too many of them and are difficult to coordinate. The second possibility is not easy to manage and presents a coordination problem. In the days following the tsunami, we have seen a fantastic worldwide movement of solidarity towards ravaged countries. Most governments promised help and money and many of them are willing to send experts to collaborate in the reconstruction. But this help, coming from every direction, is very hard to coordinate. It may, in many cases, worsen the situation. FIG may choose other ways to build this strategy and opt for a different level of intervention but this international organization has to act now, not only regarding the present situation in South East Asia, but in the possibility of future catastrophes. Daniel Roberge graduated from Laval University’s Faculty of Forestry and Geomatics, and is a member of the Québec’s Professional Order of Land Surveyors. He is carrying on Graduate Studies in International Administration at École Nationale d’Administration publique. Manager and Senior Officer at the Ministère des Ressources naturelles, de la Faune et des Parcs (Department of Natural Resources, Wildlife and Parks) since 1993, Mr. Roberge has been involved in the design, development and implementation of two of the most extensive land reforms ever undertaken in North America: the Reform of the Québec Cadastre, which covers all privately-owned land in Québec, and the Modernization of the system to record rights on public land. He is actually the Director of the Office of the Surveyor General of Québec and the Vice-President of the Champlain Branch of the Canadian Institute of Geomatics.